Calabacitas, or “little squash” in Spanish, is a Mexican dish of cooked squash often served as a side dish, but substantial enough for a hearty vegetarian main. The dish can be made as a casserole, but is often made as a thick, chunky vegetable dish served with some of the cooking liquid. In my kitchen, making calabacitas is often a very cheese affair, with melting cheeses being a favorite, but dried crumbled cheese can be just as tasty. The type of squash varies from region to region, and also based on seasonality. 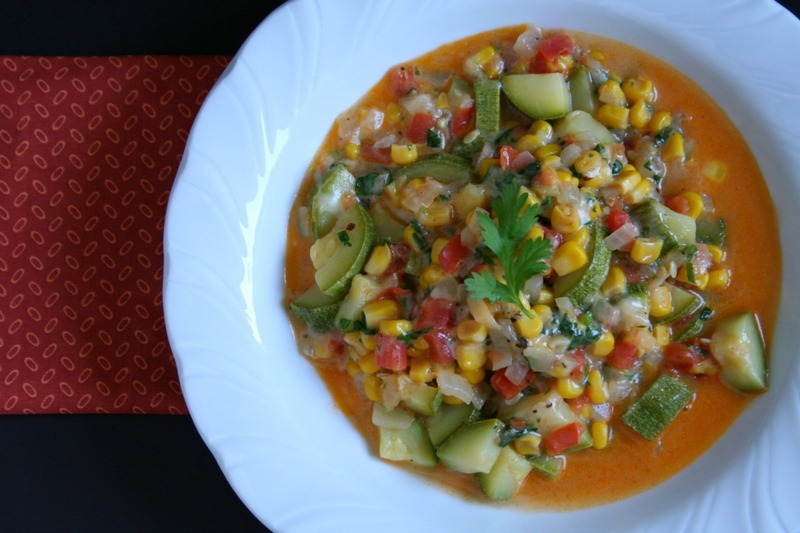 Mexicans and those in the American Southwest will use yellow crookneck, green summer zucchini or Mexican squash, but this dish is versatile. Most types of squash can be used, so this dish is perfect year round with summer squash like pattypan and winter squash like butternut, kobocha and even pumpkin. And I fondly remember the spaghetti squash calabacitas at last years Christmas party. 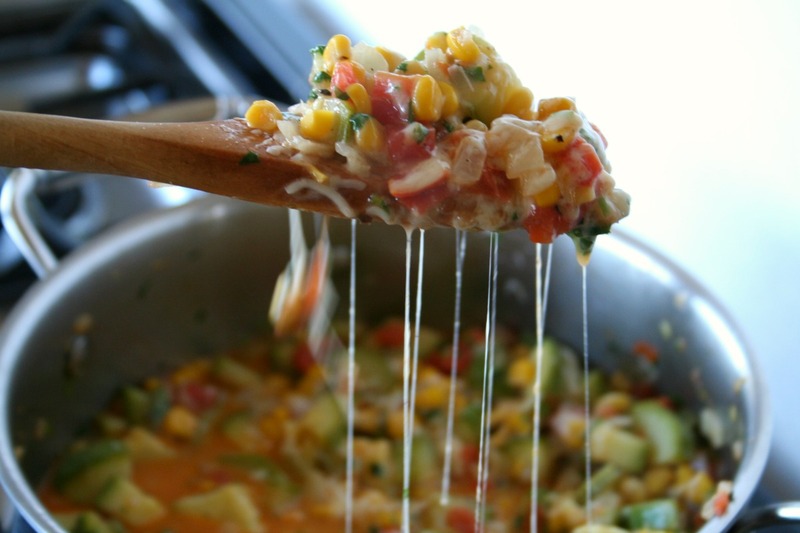 Whichever gourd you use and how ever you serve it, don’t skimp on the cheese. 1. In a medium pot, heat the oil and onions over medium heat. Sautee for 3-5 minutes, until the onions soften and become translucent. Stir occasionally. 2. Meanwhile cut dice the zucchini into bit sized pieces. 3. Add the zucchini to the onions. Stir to coat. Allow to cook for 5 minutes, stirring occasionally. 4. Stir in the corn, tomatoes, and stock. Season with the salt and pepper, or to taste. Allow to cook until the zucchini is tender, but not mushy, about 10 minutes. 5. Mix in the cheese and cilantro. Serve hot.